Consistent with what was observed in past surveys, respondents in Hungary appear to be the most inclined in Eastern Europe to offer trade credit terms in transactions with their business-to-business (B2B) customers. On average, 54% of Hungarian respondents’ B2B sales were made on credit (average for Eastern Europe: around 40%). This compares to 44% in the Czech Republic, around 40% in Turkey and 35% in Poland. At the other end of the scale, there is Slovakia, which appears to be the Eastern European country least prone to offer credit terms in B2B transactions (credit-based sales average 27% of respondents’ B2B sales value). It is worth noting that, compared to last year, respondents in Hungary appear to be much more prone to request payment from B2B customers using methods which do not expose them to the risk of payment default on invoices (one year ago, credit-based sales in Hungary averaged 72% of respondents’ B2B sales value). Interestingly, in previous years, respondents in Hungary were highly more inclined to offer credit terms to foreign than to domestic B2B customers. This reflected the perception that trade credit risk was more likely to arise from domestic than from foreign buyers. This trend has reversed this year, Hungarian respondents no longer show any preferences and offer credit terms to either domestic or foreign customers. 54.7% and 52.5% of the total value of respondents’ domestic and foreign B2B sales were made on credit (averages for Eastern Europe: 42.9% domestic and 36.6% foreign). This behaviour is consistent with what was observed in Slovakia and the Czech Republic, and is in contrast with observations in Poland and Turkey. In these latter countries, respondents seem to be notably more inclined to sell on credit to domestic than to foreign customers. Around 76% of respondents in Hungary (well below the 85% for Eastern Europe) experienced late payment of invoices by domestic and foreign B2B customers over the past year. 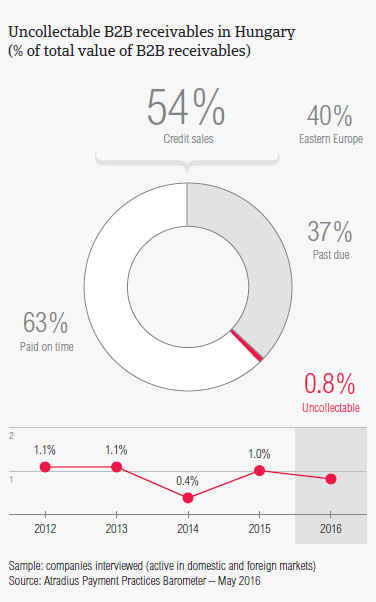 This resulted in an average of around 36% of the total value of B2B receivables remaining unpaid past the due date (below the 43% average for Eastern Europe). Late payment was reported to occur almost equally as often from domestic as from foreign customers. The payment timing of overdue B2B invoices, however, highlights that both domestic and foreign customers of Hungarian respondents pay invoices notably slower than one year ago. This is particularly the case for foreign customers (the proportion of past due invoices paid within one month of the due date has decreased to 60% from 80% one year ago). This points to a worsening in the quality of Hungarian respondents’ foreign trade debtors, which may explain why respondents are more prudent in granting trade credit to foreign B2B customers. Late payment of B2B invoices (domestic and foreign) in Hungary is reflected in the Days Sales Outstanding (DSO) figure posted by respondents. This averages 53 days (consistent with the 57 days survey average) and is nearly one month shorter than last year. This change may reflect a much higher efficiency in collecting high value, long-term outstanding invoices, particularly arising from foreign B2B trade. The firm grip that Hungarian respondents seem to have on collection of outstanding invoices may explain why 73% of respondents in Hungary (compared to 66% in Eastern Europe) expect no change in DSO over the next year. Respondents in Hungary extend payment terms to domestic B2B customers averaging around 28 days from the invoice date. Foreign customers are requested to pay invoices almost within the same time frame (on average two days later than domestic customers). Both domestic and foreign average payment terms are in line with the 30 days average for Eastern Europe. Compared to last year, payment terms extended by Hungarian respondents to both domestic and foreign B2B customers appear to be slightly more lenient (on average three days longer) than one year ago. Despite the modest increase in payment terms, respondents in Hungary had to wait on average twice as long as in 2015 for foreign overdue invoices to be settled by B2B customers. This means that respondents could turn foreign past due receivables into cash, on average, 44 days after invoicing (2015: 32 days). This is however below the 52 days average for Eastern Europe. Domestic overdue invoices, in contrast, were settled earlier than foreign ones (on average 39 days, compared to 36 days last year). These findings corroborate what was commented on earlier in respect to a relatively more prudent approach from Hungarian respondents to granting trade credit to foreign B2B customers than in previous years. Most of the respondents in Hungary reported that late payment of B2B invoices is most often due to customers’ liquidity issues. This was mentioned by nearly 76% of respondents in respect to domestic customers, and by around 66% of respondents in respect to foreign customers. These response rates are the highest across all the countries surveyed in Eastern Europe, and compare to 64.4% and 40% of respondents in the region as to domestic and foreign payment default respectively. In particular, the large gap between the country and the regional response rate related to payment default due to liquidity issues suggests that Hungarian businesses are markedly more often impacted by this delay factor than their peers in Eastern Europe. This is particularly the case for payment default on foreign invoices. This may explain why more respondents in Hungary (15.2%) than in Eastern Europe (10%) perceive collection of outstanding invoices, particularly abroad, as the biggest challenge to business profitability this year. Consistent with the special attention on the collection of past due receivables shown by Hungarian respondents is their opinion that customers’ late payment did not have any significant impact on their business. This was expressed by nearly 70% of respondents, compared to 45% in Eastern Europe. This finding reflects Hungarian respondents’ strong focus on protection against payment risks. Notably more respondents in Hungary (55%) than in Eastern Europe (45%) will not change their credit management tools mix over the next 12 months. Not surprisingly, given the strong focus of Hungarian respondents on collection of outstanding receivables, the proportion of write-offs reported by respondents in Hungary is less than 1% of the total B2B receivables value (average for Eastern Europe: 1.2%). Uncollectable receivables consisted almost entirely of domestic write-offs which originated most often from the construction and food industries. The majority of respondents in Hungary (around 67%, compared to 55% in Eastern Europe overall) reported that B2B receivables were uncollectable mainly due to the fact that the customer went bankrupt or out of business. Survey respondents in Hungary reported granting trade credit terms mainly to B2B customers in the construction, food, business services and services industries. Invoice payment terms extended by Hungarian respondents to their B2B customers in the construction industry are on average two weeks longer than the average payment term observed in the country. Despite this, the construction industry generated an above average (for the country) proportion of past due invoices. According to most of the respondents in Hungary (78%), slow payment from B2B customers in the construction industry is most often due to liquidity issues. 84% of the respondents in Hungary anticipate no significant change in respect to payment practices of B2B customers in the food industry over the next 12 months. Around 30% of respondents, in contrast, anticipate an improvement in payment practices of B2B customers in the construction and services industries. No significant change is anticipated in respect to payment practices in other industries. Hungary has become a key production base for automotive majors such as Audi, Daimler (Mercedes-Benz), Suzuki and General Motors. Economic growth is expected to continue in 2015 and 2016, although at a slower pace: by 3.0% and 2.4% respectively.